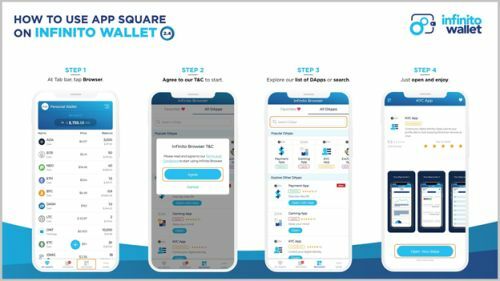 SINGAPORE, Feb, 11 2019 - (JCN Newswire) - App Square, our hotly anticipated browser for DApps, is now officially available on Infinito Wallet, version 2.4. With this DApp 'store', Infinito Wallet has become more than a universal home for leading coins and tokens on the market, it is the universal home for all apps built on blockchain. Currently, App Square supports DApps built on Ethereum blockchain. However, DApps built on EOS, NEO, Ontology and more will be added soon, to the built-in App store with innovative applications and services for end-users, developers and businesses. Kyber Network is a popular exchange where you can securely convert one crypto asset to another, and earn passive income with your crypto on 2 lending platforms. Nexo offers instant crypto-backed loans, free of hidden fees, while you can deposit your crypto at the Celsius Network and earn interest. For convenience in profile and transaction risk management, Blockpass and Coinfirm are both available on App Square as well. Listed DApps are seamlessly connected to Infinito Wallet so you can quickly and securely make payments using any crypto available in your wallet. Your App Square will display as Infinito Browser in-app. Remember that to use and perform transactions on a DApp, you will need the blockchain address of its platform in your wallet. There are 2 types of DApps, 'web-based apps' that run on browsers, and 'native apps' that can be downloaded onto your device via an App Store and Google Play Store. Both are supported by App Square. We expect to update App Square frequently, bringing added value to our users by reaching out to community-favourite DApp developers for any convenience you may think of: Games, Exchange, Crypto News and more. In doing this, Infinito Wallet becomes a truly a universal solution which enables our users to interact and enjoy the benefits of blockchain. List your DApp on App Square? If you have an awesome DApp and want instant users, apply to have it listed on App Square today via [email protected]. Being listed means your DApp engage our massive community of more than 60,000 active monthly users among 400,00 downloads pr month. For DApp developers, the Infinito team provides a development platform to help you create DApps easier and faster. Infinito Blockchain Platform (IBP) has a wide variety of blockchain modules including API/SDKs, Software-as-a-Service (SaaS) Solutions, DApp and Smart Contract templates, and more. Decentralized applications (DApps) operate on smart contract blockchains with no central server. These apps can serve a variety of functions such as Finance, Exchange, Game, Social, Compliance, Education, and more. As they are built on top of blockchains, DApps are more transparent and secure compared to regular apps in terms of payments and data storage. Positioning as a leading universal wallet for crypto users, Infinito Wallet serves as a gateway for users to maximize the usage and potential of their cryptocurrencies. By selectively expanding our partner network, Infinito Wallet aims to build an ecosystem of practical blockchain services including exchanges, ID/KYC solutions, and other blockchain-related business services. At the same time, we help support communities of developers and businesses with an open blockchain infrastructure of technologies and compliant-ready services, so that they can seamlessly build, launch, and operate innovative products and services efficiently. Infinito Wallet's core development team of blockchain R&D experts has intensive professional experience. Currently, our organization consists of more than 300 members including developers, designers, business and marketing specialists. We are promoting research on infrastructure for cryptocurrencies, and developers utilizing blockchain. Visit https://www.infinito.io, https://www.infinitowallet.io, and https://platform.infinito.io/. Copyright ©2019 JCN Newswire. All rights reserved. A division of Japan Corporate News Network. Mitsubishi Shipbuilding Holds Christening Ceremony for Next-Generation LNG Carrier "Diamond Gas Sakura"